Every day Ethel surveys the land around her, taking in the weather, chasing away bugs, and rolling lazily on the sidewalk in the sun. And that's the way she likes it: Ethel takes pride in being set in her ways. 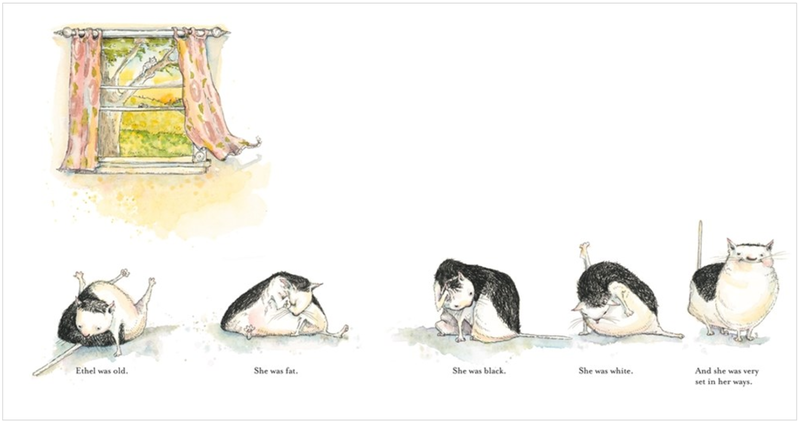 When she accidentally rolls in sidewalk chalk and turns blue, her entire day is thrown off kilter, and it takes a kitten named Fluffy, who has rolled in chalk himself and turned pink, to help Ethel see how being flexible to change can be a good thing. The mixed media illustrations are soft, yet rich in color when the situation warrants. We see Ethel sitting completely alone, a small dot in a muted field as she stares at a soft blue sky. The brightest part of the illustration is simply a grouping of red poppies. 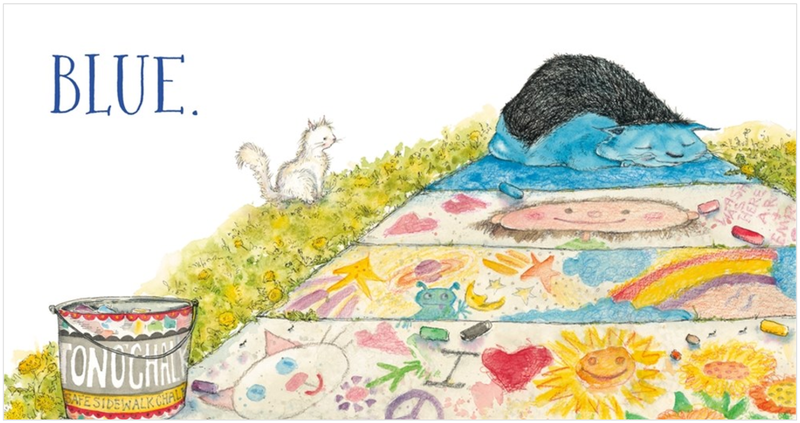 But when we see poor Ethel asleep in the blue chalk, she's surrounded by chaotic colors that foreshadow the loudness (and friendship!) to come. Eventually readers come to see these bright colors (and friendship!) consume Ethel and allow her a kind of flexibility she never knew she had. 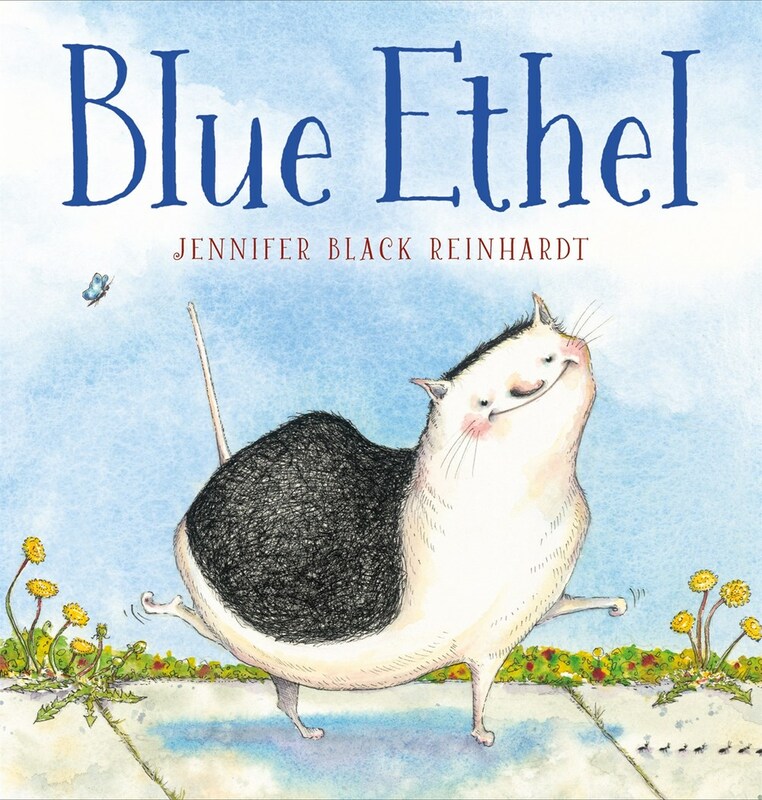 Blue Ethel published earlier this year from Farrar, Straus & Giroux.